Whether you have been following me for a little while or are new to the blog (hello, new friends! ), you have probably noticed by now that I am a huge fan of Marissa Webb and her incredible designs. She has such a keen eye for blending the latest trends with classic, timeless silhouettes. I always resonate with her pieces because they strike the perfect balance between boldly feminine and casually masculine. That being said, I’m so excited to continue on as the brand ambassador for the Spring 2019 season! There’s more goodness to come, so stay tuned 😉 But today I’m excited to share a couple of looks that I had such a fun time styling – with MW pieces in the spotlight, of course. I have said it before and I will say it again – no one does high waisted pants better! These are one of her latest updates in a menswear-y linen houndstooth. Just like all her pieces, they feel so special yet sooo easy to style. I loved the way these looked with a laid-back band tee (similars below! ), but I wanted to keep this look elevated so I threw on some simple-yet-alluring pumps. 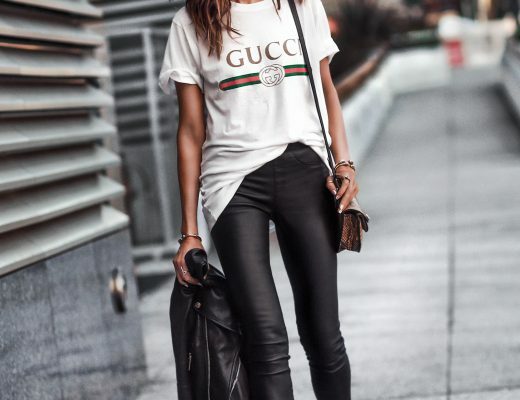 There are so many ways you could style these pants – I especially love how they can be dressed down by pairing them with a great tee! Keeping with the elevated-casual theme for this second look…I love a good fresh white tee, and this sequin version is the chicest novelty update. So fun! I couldn’t believe it when she told me, but every sequin on this top is individually hand-beaded. Talk about quality! I actually love the way you almost can’t tell that it’s a sequin top at first – so subtly unique but definitely a standout. MW is all about the oversized tee look (which I looove) so I decided to style this one with slimmer, textured grey denim (similars linked below) for a “chic tomgirl” look. I loved the idea of styling the sequin top with a shoe that pops – these snake print boots play off the details of the shirt sooo well. Tee: Alice + Olivia – also love This & This one! and T-shirts, so what a great way to jazz things up! And I agree the shoes are a perfect touch! Love the sequin top and the houndstooth pants! Where did you get the tee from? “The Who”, that is. I love the look! I like this look! 🙂 Really nice, wow! Love your style! I could wear it all! What are your sunglasses?